Trading of Industrial Pumps, Portable Lubrication System and many more. Established in the year 2009, we, Winner Lubrication, are one of the noted traders, suppliers and distributors of a gigantic assemblage of Mechanical Products. Our product range encompasses of Lubrication Equipment, Precision Vices and Portable Lubrication Systems. Our company holds the Authorized Dealership for Tuthifull Fillrite Flow Meter & Dispensing Systems, in Tamil Nadu District and the Authorized Retail from the Management of Groz Net Industries in Tamil Nadu. Our product selection is made available in a varied range of specifications, to cater to the varied requirements of our valuable purchasers. Obtained from our experienced and knowledgeable vendors, our product series is immensely popular for its quality and performance. We are backed by a magnificent warehouse facility that is set up with different machines, tools and basic amenities, which support us with the obstruction-free storage and easy loading & un-loading of the proposed selection. Furthermore, we get constant support and efforts of our experienced & qualified professionals, who put in their best efforts in attaining the goals of our company, with the best of their abilities. We proffer an optimum blend of quality and price in the market, so that we retain and earn the trust of our prestigious purchasers. Under the incomparable leadership of Mr. B.S. Jayshankhar, our Proprietor, we have earned an unmatched reputation in the business. With the constant guidance and regular motivation of our mentor, we get inspiration to attain the best quality possible. At our company, the workforce is recruited on the grounds of technical knowledge, years of industry experience and educational qualification. All the professionals work in complete co-ordination with each other and work extremely hard to accomplish the organizational objectives of our company. Furthermore, we conduct several workshops, training sessions and seminars to enhance the skills of our team. By following strict quality parameters we are able to fetch vast clientele across the nation. Our quality experts monitor the entire procurement phase and deliver quality approved product range to our valuable clients. Our experts deploy stringent quality parameters thereby ensuring its flawlessness. We source the entire product range from certified vendor base. We are a well known in the business that is associated with some of the leading vendors of the market. Our vendors are selected on multiple grounds, after thorough research. Following a quality-centric approach, our vendors emphasize on the quality of the products proffered and ensure that the varied requirements of our esteemed customers are met. Our vendor base is one of the major causes of our success and name in the market. Latha Traders is one of the celebrated names of the business, which engages in proffering quality grade range. For not only the amazing product selection, but also, are we acclaimed for our standardized packaging and on-time delivery. In the upcoming years, we wish to maintain the unmatched reputation & position that we have garnered in a minor period. Moreover, our company involves in ethical business dealings only. 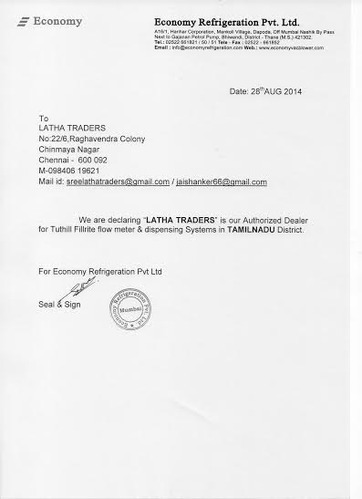 We have become an Authorized Dealer for Tuthifull Fillrite Flow meter & Dispensing Systems in Tamil Nadu District. 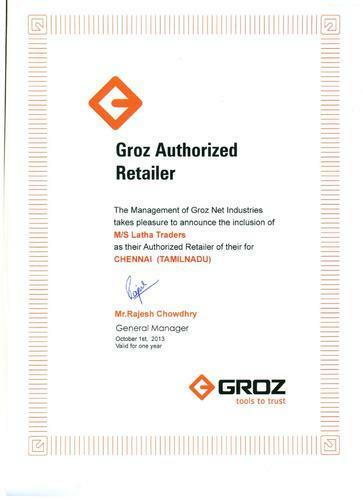 We are announced as the Authorized Retailer from the Management of Groz Net Industries in Tamil Nadu.